Just the other day, Senator Rand Paul filibustered the nomination of John Brennan for director of the Central Intelligence Agency (CIA). Senator Paul did so in order to seek answers to his questions to President Obama, on statements made that indicate the POTUS believes he has the power to use drones to assassinate Americans on U.S. soil, without charge or trial, ie without the due process of law. The comments that gave Senator Paul concern included a letter from Attorney General Eric Holder, and also recent comments from the President during a Google interview. Of course these comments come after the previous Secretary of Defense admitted to assassinating an American citizen without charge or trial, and following a leaked Department of Justice (DOJ) white paper claiming the power to assassinate Americans. This is an extremely important issue, and in my view is the most important issue in all of American history. It should also be of great importance to every person serving in our military today. The trend has been to turn our tools of lethality inward, and I for one have been blogging about this trend for some time now. I am glad to see this issue finally discussed at length on Capitol Hill. The entire thirteen hour filibuster and discussion of the issue by Senator Paul from Kentucky, Senator Cruz from Texas, Senator Lee from Utah, and others can be viewed online here. I recommend all Americans, but especially those of us commissioned to wield the tools of lethality in the military, take the time to watch the entire filibuster discussion, and those of us commissioned in the armed service ready ourselves to exercise our own constitutionally required check and balance in defense of the Constitution. In other words, we need to be ready to refuse unlawful orders, should some of our elected leaders fail in their duties to defend our nation's highest law and instead decide to turn America's military against the citizenry that funds it. However, what appears to be lost on Attorney General Holder, John Brennan, Jeh Johnson (before he left the government), and others is that the United States government cannot legally assassinate Americans who are presenting no imminent threat (ie actively engaged in violence). It doesn't matter if in Yemen, or in Seattle, the Constitutional restriction of the Fifth Amendment applies anywhere in the universe where an American citizen and his or her government intersect. The Fifth Amendment's guarantee that the government cannot take life, liberty, or property without the due process of law has no geographic exception. I have previously blogged about my understanding of the law, and also touched on the erroneous legal reasoning of Attorney General Holder, John Brennan, and Jeh Johnson. During the filibuster, some in the Senate touched on some of these same issues. In essence, what was debated in the Senate the other day was the very existence of America as a free nation, versus changing the government to a monarchy or authoritarian government. That isn't hyperbole. A government that claims the power to kill its own citizens, based on the whim of one government person or a group of persons, without the due process of law that has been the bedrock of justice throughout American history, quite simply cannot be described as the government created by the Constitution. 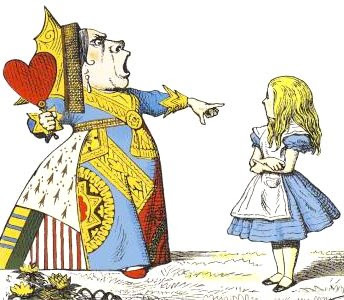 It is not a variation of that government, or that government gone astray, but rather it is a different government entirely, one that is more akin to the government of the Queen of Alice's Wonderland, who twists justice and exclaims "Sentence first! Verdict after!" First, words are weapons. When it comes to those who wish to sidestep the Constitution while avoiding the charge that they are violating the law, the law must be twisted and that means that words must be destroyed. This is a tactic we have seen used throughout American history, and certainly over the last decade. This tactic is usually employed by government lawyers who sadly use what legitimacy their profession offers, to muddle and "make a case" for "their client." Unfortunately, they make a case using a lack of integrity, and they misdiagnose their client by ignoring the American people who pay their bills, and instead act as propagandists for their immediate supervisors who wish to break the law. Typically a profession is held to a higher standard than a regular job, in part because of a required code of ethics, yet the legal profession is filled with the immoral who provide legitimacy to government law breaking just as priests used to provide legitimacy to Kings. In this recent discussion, Senator Lee from Utah diagnoses the destruction of language in the leaked DOJ white paper, seizing on its dishonest destruction of the term "imminent" to describe an imminent threat. By destroying the term imminent threat, the white paper essentially gives cart blanche to the government killing any American it wants, for whatever reason it wants, without that person actually having to pose an imminent threat or any real threat at all. As Senator Lee says at one point, the white paper's explanation of "imminent threat" is like a peanut-butter jelly sandwich without the peanut-butter or jelly, there is nothing there. I should note that Senator Lee is a lawyer, and a former Supreme Court law clerk for Justice Alito. Senator Ted Cruz of Texas, is also a former law clerk for former Chief Justice of the Supreme Court, William Rehnquist. For those not familiar with the legal community, clerking for a justice is an extremely serious legal credential and we are fortunate to have such amazing legal minds serving in our Senate. Second, Senator Paul repeatedly took issue with the claim that assassination of Americans outside the United States was legal if capture was not feasible. The senator pointed out that the statement on feasibility, seemed to imply that killing an American was legal if capture was inconvenient. I share the senator's concern and think it is important to remember that if we can kill an American, we can capture him. Just as we invaded an entire country, and lost the lives of service members, in order to capture and try Manuel Noriega. Noriega was, of course, not an American citizen and today he sits in prison having been afforded due process of law. Third, we in the military should understand that a targeting process is nowhere even close to the due process required by the Fifth Amendment to the Constitution. Several guys in the executive branch asking themselves if they should kill an American, is not a trial and a jury of peers. Senator Paul touches on this disparity and overemphasis of "targeting process" as if it holds some value in exchange for due process. Senator Lee does a good job explaining the protections afforded to all citizens, wherever they may be located, from the government. Senator Barrasso of Wyoming also sheds light on many questions concerning the targeting "process," asking for example, the number of individuals that have ultimately not been placed on the kill list during secret deliberations due to objections. Fourth, Senator Paul touches on what I would term "picking battles." He provides a good reminder of what it means to be a public servant, and explains that while we should be civil, we must still be principled. As public servants we are either serving the public, or we are providing a disservice to them. When we refuse to stand up for those who pay us to do a job for them, out of our self interest or cowardice, we do a disservice to Americans. Lastly, for those of us in the military, we need to understand that assassinating an American with a drone is no different than pulling out your weapon in a Wal-Mart and shooting a person while they browse the frozen food section. Senator Moran makes this point effectively. It is easy to detach ourselves from behind a console while looking at infared signatures, but it is important that our officership and professionalism not be put on a shelf because we might feel hidden and anonymous while working from a trailer anywhere in the world. For those who object to the term "assassination," Senator Cruz of Texas disagrees with you, as does this humble blogger. It should also be noted that, as a result of the filibuster, the Attorney General sent a letter of response to Senator Paul saying that the President does not have the authority to kill an American on U.S. soil with a drone. It should be remembered, however, that while it is rare for a President to discount and disagree with his Attorney General on a legal matter, and act on his own legal understanding rather than that of his top legal advisers, it has been done before. In fact, President Obama disagreed with Mr. Holder and acted outside the council of his top lawyers with regards to actions in Libya. I recommend all those serving today, who are not ready to do right by their nation, find a new job. America has gone down the rabbit hole. We are in the business of risking ourselves for our country, for Americans, and we must be ready to do the right thing. If you do right in the face of wrong, it won't always turn out in your favor, but sometimes it will. Regardless, as military professionals who took an oath to defend the Constitution, it is time we take a deep hard look at ourselves and ask ourselves if our country truly means something to us. Our combat time means nothing, and a wing award and promotion two-below means even less. The typical ways we judge our success in the military are child's play metrics in our serious world, with the very serious threats to our nation. Few are tested these days, but unfortunately that will most definitely change. We must be ready to do right for America, by refusing to do wrong, if and when the time comes, and when we are truly tested as real men were tested in generations past.